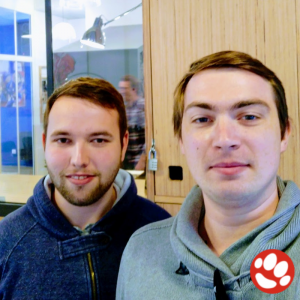 Lénaïc and Antoine would like to share with you their experience with Docker and Symfony 4. Lénaic has recently joined KNP as a back-end developer, which does not stop him from playing with React on an internal project. You can follow him on github and twitter. 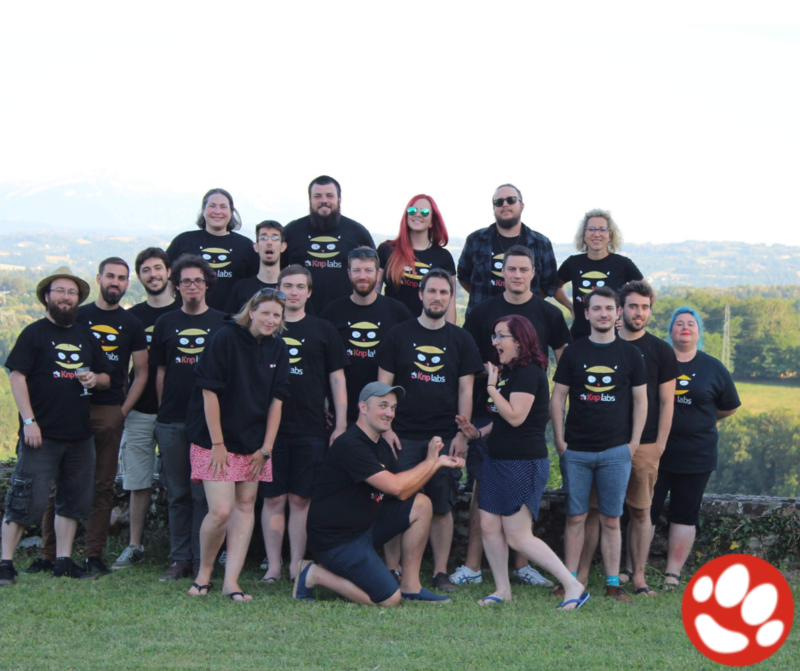 Antoine came to us 3 years ago as a Symfony Lover and developed a preference for front-end projects with React. You can follow him on github and twitter . These requirements are probably the most common ones if you want to develop a Symfony 4 application. Why do we recommend Docker in your Symfony application ? The time when your tests were valid on your local machine but failed on the CI for some reasons is over. The first thing we need is to install Docker on your computer. Docker brings a simplified way to wrap our softwares into containers that includes everything it needs to run: code, runtime, system tools and libraries. Docker-compose is a tool for defining and running multi-containers based applications. In particular, it brings everything we need to allow our containers to communicate to each other through a private network and shares filesystem area through volumes. See https://docs.docker.com/install/ & https://docs.docker.com/compose/install/ for full documentation. And it is … done. You have everything that you need on your computer. Important note: This directory structure is just what we do at KNP Labs most of the time. It is not based on any convention and it is up to you to follow it or not. Just note that the following steps will be based on it and that you might have to adapt the code according to your own directory structure. You need a file where you will list all the images required in your application. Now we will enumerate what we need in our Symfony application. First of all, we need a database engine. Let’s say MySql. You can of course change to Postgres or MariaDB. Let’s try to create our file. The first line specifies the docker-compose syntax version. Now that we have a database engine, we will need a http server such as Apache or Nginx. In this example, we will use Nginx. As you can see, there are more instructions than the mysql configuration. You may notice that we provide a specific version of Nginx, “alpine”. You can chose the one you prefer on Docker Hub, but we recommend Alpine. Alpine is one of the lightest weight version of Linux, so it will cost less resources for your computer. We also have volumes. Volumes are used to share a file system area between your computer to your container. This is particularly useful in dev environment when you are constantly making changes in your source code. As the container and you local machine share the code through the volume, the container doesn’t have to be rebuilt each time a change occurs. On the root of your application, you can create a directory “docker”, in the directory, you can add a subdirectory “nginx”. Now you can add the configuration file given below named “default.conf”. For the Symfony3 version, you can change “public” by “web” and “index.php” by “app.php”. We still need to give this configuration file to our nginx container. This can be done by sharing this file through a volume. Our docker-compose is almost finished. This line means that we’ll transfer any incoming request to php-fpm on port 9000. Indeed, containers communicate to each other through a virtual network on your computer and on this network the “php” container can be reached through the name *drum roll*… “php” ! Which means that the nginx container must be built and run after the php one. Final poin t: why does the statement user: 1000:1000 stand for ? This statement is used to tell the service that it will have to use the user with uid 1000 and gid 1000 internally. In most cases, the user we use on our local machine is the user with uid 1000 and gid 1000. By adding this statement, both container and local system will interact with files (through the volume) with the exact same user (uid) and that will prevent you to have permission related issues. Now there is another thing to do. As you can see, there is no image. We provide a Dockerfile. We will see now how to write it. The Dockerfile is used to give several instructions when we get our images. You can, for instance, install php extensions or execute unix commands. In our example, you can create a “php” subdirectory in your “docker” directory. In this directory, you can create a file “Dockerfile”. The code here, will use a Docker Image “php:7.2-fpm”. After getting this image, the “pdo_mysql” library will be installed. For more convenience, you tell Docker that the default directory will be “/usr/src/app”. Then we copy our current application in our computer, to “/usr/src/app”. We have now everything for running our app. Important note : You must be sure to free the ports of your local machine. For instance if you already have a running instance of nginx listening on port 80, be sure to switch this service off to allow your brand new container to use it. It is easy now. You just have to open a terminal at the root of your application. This command will build everything we need from the “docker-compose.yml”. Even if we have a running project on docker, there is still some improvements we can do to clean things. First we hard coded some parameters inside our `docker-compose.yml` file. We will export these parameters inside a .env file which allows to override them with env vars. Which variables will we export ? Note: We highly recommend you to not version this file but create a duplicated `.env.dist` file that will be versioned so that each developer of your team can configure their own `.env` file. Now our docker-compose.yml can have env vars based configuration which allows each developer of the team to configure the project as they intend to. But we can go even further ! Let’s say we want to deploy these containers on production. Do we really need to share volumes and rebind ports between my containers and the host machine ? No. We need a way to configure such things in a separated place that just belongs to the host machine. docker-compose.override.yml to the rescue ! Now you have a really clean Docker configuration that is usable by anyone on your team and easily deployable on a real server ! On my system Ubuntu 18.04, there is no /usr/src/app. It's a problem ? I'll check the blog, though. Anyway, yes, native bind mounts on Windows (they use, err… Samba, I think?) have catastrophic performance, but NFS with WinNFSd works. That's what some people use with Vagrant VMs on Windows, too. Hey Victor, thank you for the heads-up. The dev environment I use on Win10 is built upon connecting to the Docker for Windows daemon from WLS (Ubuntu 18.04 on the Linux subsystem). Check out this guy's blog: https://nickjanetakis.com/ he has a working solution for this setup (Win10 + Docker for Windows + Ubuntu 18.04 on WSL + native Docker CE and docker-compose on Ubuntu). In the mean time, I've managed to solve the mysql 8 authentication problem I mentioned above with a simple "command" line in the mysql section of docker-compose.yml that sets the default auth plugin to mysql_native_password. The very next day it turned out that our database was being hosted on Google Cloud SQL that does not support MySQL 8. :D So, I had to dial back to 5.7 which does not have this auth problem. Sigh. Regarding Symfony's performance in Docker, all the other backend devs around me use Ubuntu on their PCs (I'm the only Windows guy left), and the performance is way better in those environments, but like 4-5x times better. My 2500 ms request goes through in 500 ms or less on their PCs. Same code, same Docker setup, the only difference is in the dev enviroment. I'm looking forward to the new Win10 update in May and will reinstall my notebook and all the WSL stuff with it. We'll see if a fresh start helps or not. Ha, you're right! I was focusing on nginx and didn't even notice this. You need a named volume, or a bind mount (less efficient, but safer). I've been building a dev and testing environment for a 2.8 project for a few months now, on a Windows desktop. Performance is a huge issue. I managed to mitigate the problem using an NFS mount on the dev env, and moving cache and log directories out of the shared source directory. Moving the vendors also noticeably improves performance, but it has a few gotchas, and I've stopped doing it for now. I might write something about this, because I've been pulling my hair trying to get a working stack on both Windows and Linux, and there are flaws in every single post I've found including this one. On you "production" docker-compose.yml, you did'nt specify any bind mount nor any context or Dockerfile. How is the public directory shared with nginx, then? You may copy the public directory to the nginx container, but if you run the symfony scripts in the php container, nginx won't know about compiled assets and symlinked vendor assets. Also, you first COPY your source code in the php container, then on the second example of your docker-compose.yml, you declare a bind mount. Hello ! Thank you very much for this article. With the given configuration, it seems that the database data will be lost every time the container is restarted or stopped. How do you manage your db data in production? Hi! How can I add yarn to my projects? My other question is regarding speed. I follow Ryan's Sf4 tutorial course at KnpU (now SfC, I guess). Apart from a few hiccups with apcu, I had no problem following episode 1 and 2, but for Doctrine I needed MySQL, so I had to dockerize the whole project. That's how I found your solution. The good news: it works. Bad news: it's painfully slow. A simple page reload takes about 1500-2000 ms (even with cached volumes), and this is a very simple tutorial page. Again I looked around, and one of the probable causes might be the vendor or the cache folder, but since I'm not comfortable with Sf4 yet, I don't want to rearrange anything in the project structure. I use a hefty HP notebook with a recent i7 CPU and 16gigs RAM. What makes it even stranger, never had the same experience with Laravel and Slim projects which we run with a monstrosity called Laradock. What's your dev experience regarding this?